Baking powder – a mixture of a mild acid, usually cream of tartar, and a mild alkali, usually bicarbonate of soda, that forms a chemical reaction when wetted. The effervescing is caused by carbon dioxide gas forming, which causes baking to rise. 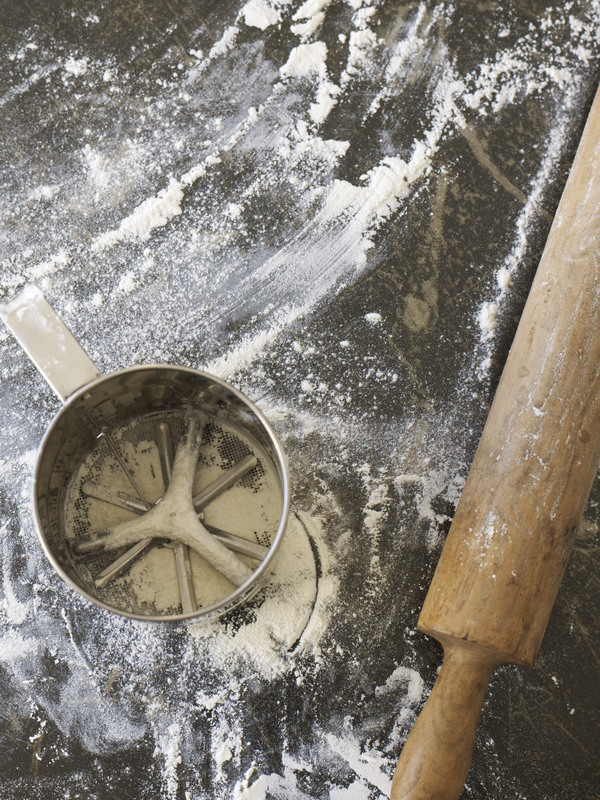 Any mixture containing baking powder must be cooked straight after mixing to utilise its full potential. Replace it on a regular basis – it will keep fresh for about 12 months. Bicarbonate of soda – more commonly known as baking soda. Buttermilk originally referred to the liquid residue left behind after milk or cream was churned to make butter. These days ‘cultured’ buttermilk is made by adding a natural culture to standard or skimmed milk. Using buttermilk for baking – think scones and hotcakes – makes it lighter and adds a pleasant slightly tangy flavour. You can make a reasonable substitute by adding a few squirts of lemon juice to milk and leaving it at room temperature for 30 minutes. In the United States this is known as cornstarch, and is starch extracted from corn (maize) kernels. Do not substitute corn flour, which is ground from whole corn kernels. These are known as Graham crackers in the United States and Canada. For cake making, a soft, low-protein flour milled from soft wheat varieties will produce a cake with a fine, even and tender texture; this is sold as standard flour or cake flour. Low-protein soft flour is also the best for shortcrust pastry and produces a tender, light pastry; but when making choux pastry, use high-grade or strong flour to give the batter strength and structure. High-grade flour contains more protein and is the one to use when making puff pastry and breads, or in heavier mixtures such as fruit cakes. It is not recommended for general cake making because it will make the crumb tough and cause the cake to ‘peak’ at the top. Use self-raising flour as directed; but if not available, use 1¼ teaspoons of baking powder for 160g (1 cup) of standard flour. Golden syrup is a by-product of sugar refining – a thick sticky syrup produced when sugar cane is boiled down to produce sugar. Treacle, produced similarly, is darker and stronger-flavoured. Both syrups are used in baking to give flavour and colour and to help keep baking moist. Golden syrup is sweeter than treacle. Opened cans are a magnet for ants, so store in the fridge if you have that problem. Sugar sweetens cake batters and helps to brown the outside of the cake as it caramelises during baking. It also keeps the texture of the crumb tender. Caster sugar – also called superfine granulated. This is finer than standard granulated sugar and is used in baking because it is easier to cream with butter or mix with other ingredients. Demerara – these hard, light-brown crystals with a mild caramel flavour get their name from Demerara in Guyana. They are especially good for forming a crunchy topping on baking. Granulated sugar – another way to describe regular white sugar (the sort you serve with tea). It’s used in syrups because it produces a clearer result than caster sugar, which can produce a cloudy syrup. Icing sugar – also known as confectioner’s sugar, this is smooth, fine and powdery. Starch is often added to it to keep it lump-free. Soft brown sugar – soft sugar with a sweet caramel flavour. Muscovado – a raw sugar with a strong taste of molasses that adds plenty of flavour to rich fruitcakes, boiled fruit cakes and other dried fruit baking. It is also good in chutneys and pickles where a dark colour is welcome (if you want light coloured or clear pickles, use white sugar). Pass it through a coarse sieve before using. Palm sugar – made from the sap extracted from young palms, boiled down to a syrup and dehydrated into discs. It has an intense, sweet caramel-like flavour and is often used in fudge. Grate or chop before use. Store in an airtight container. Pure vanilla extract is made from real vanilla. Vanilla essence is a cheap imitation. Recipes on this site use the genuine article. Vanilla pods have plenty of flavour and can be reused several times – just as well, as good pods are expensive. If infusing custards and creams, rinse the pod thoroughly under running water after use. Dry the pod on a piece of paper towel on a sunny windowsill, until it is thoroughly dry. It will still have plenty of flavour so store it in a cool dry place in an airtight container. Alternatively, imbed it in a jar of caster sugar with a tight-fitting lid. Leave for at least 3 weeks before using the sugar in recipes that call for both vanilla and sugar. Alternatively, crush a vanilla pod in a liquidiser with coarse granulated sugar, then store in an airtight container and use as required. Modern ovens have a range of settings designed to produce the best result for a variety of cooking methods. The oven-baked recipes on this site are either cooked on regular bake (an even top and bottom distribution of heat), or fanbake, a fan-forced distribution of heat which produces a slightly drier and faster form of cooking. Roasts, roasted vegetables and dishes where top browning is desired respond well to fanbaking. If your oven does not have a ‘fanbake’ facility, add an extra 10°C (50°F) to the suggested cooking temperature in the recipes calling for fanbake and be prepared to add a few more minutes to the cooking time. If your oven is slow to brown food on the top, increase the heat as suggested and cook dishes in the top third of the oven. Cakes on this site are cooked on a regular bake setting, which produces a more even top, bottom and middle heat. Set the oven rack below the middle of the oven so that the top of the cake is in the centre of the oven. For more information on oven settings go to Weights & Measures and scroll down. For information about yeast, and how to convert measures of fresh yeast to dried, or vice versa, go to Weights & Measures, and scroll down to Special note on yeast. You’ll also find other ingredient conversions and useful information on cake tin sizes, oven temperatures and metric and imperial weights and measures.